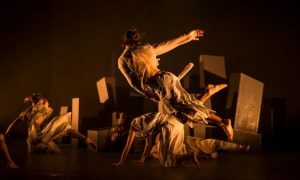 A riveting thought provoking work, Dark Matters by Canadian choreographer Crystal Pite, blazed into the Sydney Theatre as part of this year’s Sydney Festival. Vancouver based choreographer and performer Pite has created works for various Canadian and international companies and several independent dance artists, most recently Louise Lecavalier. 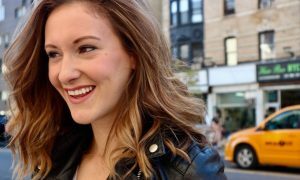 In 2001 she formed her own company Kidd Pivot Frankfurt RM, which tours nationally and internationally, and she continues to create and perform in her own work. Pite is an Associate Dance Artist of Canada’s National Arts Centre and Associate Choreographer of Nederlands Dance Theatre. This particular work, Dark Matters, explores how death is amongst us and within us. Yet it is not really bleak or depressing. It struggles to examine life and reaffirm that the cycle of life continues. Act 1 is more a visual theatre piece than a dance piece. It opens with a man (Peter Chu), in a cluttered room, crouched over a messy table feverishly constructing something. 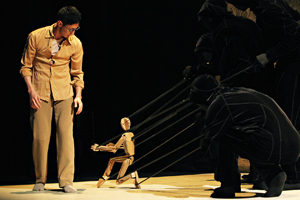 He creates a metre high puppet that becomes the other central character of the work. 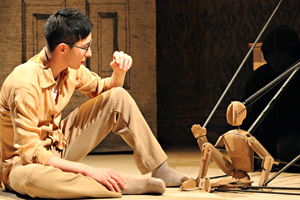 It is a dark tale, with shades of Frankenstein’s monster, that tells of how this puppet is created, develops its own strong personality, wreaks havoc and eventually kills its creator. We see an extraordinary stylised display of Japanese bunraku with koken. When first created the puppet leaps and floats in joyous abandon. At times the puppet echoes the movements of its creator and there are marvelous images of it walking up the man’s legs, clinging to its creator’s knees when lonely and scared by a storm. However, the puppet refuses to wear the trousers specially fashioned for it, and becomes rebellious. In this section there is a wonderful Matrix-like martial arts sequence by the puppeteers. By the end of this act the whole set has collapsed and we see back to the walls and wings with the lighting rig exposed. The music by Owen Belton is at times reminiscent of a movie score. Rob Sondergaard’s lighting is starkly dramatic and includes the use of strobe lighting, spotlights and sidelights. He uses fade ins and fade outs at times that are quite cinematic. Act 2 opens with an astonishing solo for the character of Death, danced by Crystal Pite. An inky spider on a bare white background, or loaded calligraphic brushstrokes of movement on a clean page, she moves like rustling black velvet. 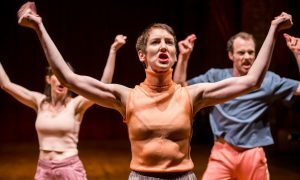 On a bare stage, the rest of Act 2 is a series of ensemble work, full of seething masses or bubbling globules of movement, at times frozen in sculptural tableaux, interspersed with solos and pas de deux. The six dancers are in casual, colourful, street clothes. The dancing itself is sensational, full of a sense of weightless fluidity, yet with a taut stretched line and incredible control. 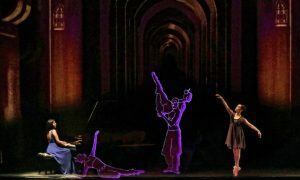 At times the choreography mirrors some of the puppetry in Act 1. The two acts are also linked by the repetition of Voltaire’s poem on the Lisbon disaster, telling us we are ‘a temporary blend of blood and dust put together only to dissolve, our being mingles with the infinite’. At the end, Death (Pite) strips to bra and pants and there is a lyrical, extremely moving pas de deux with her human creation to Sleep by Eric Whitacre. The number ends with him dying in her arms and her determinedly attempting to repair him and bring him back to life. An extraordinary meditation on the nature of life and creation. Running time 2 hours including interval.